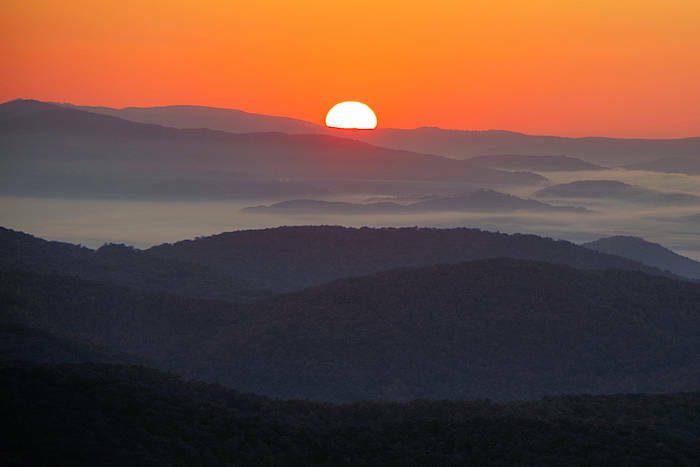 Where are the best places to watch the sunrise and sunset over the Blue Ridge Mountains near Asheville? We are lucky to have many choices - including remote mountaintops, roadside overlooks, serene lakes surrounded by peaks and even rooftop bars in the city. 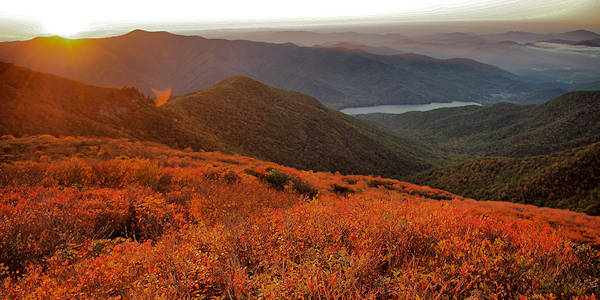 Blue Ridge Parkway: There are many overlooks along the Parkway where you can watch the sunrise or sunset from your car - or better yet, while tailgating or picnicking. Our favorite place for a sunrise is the Mills River Valley Overlook at Milepost 404.5 (pic). It's near Mt. Pisgah, so you could have breakfast afterwards at the Inn! Just remember that sections of the Parkway often close during the winter. 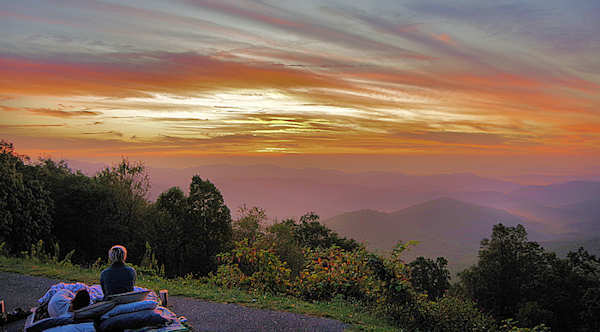 Waterrock Knob is a local favorite to watch the sunset from the parking and picnic area. Cowee Mountains overlook (Milepost 430) is another super scenic spot. 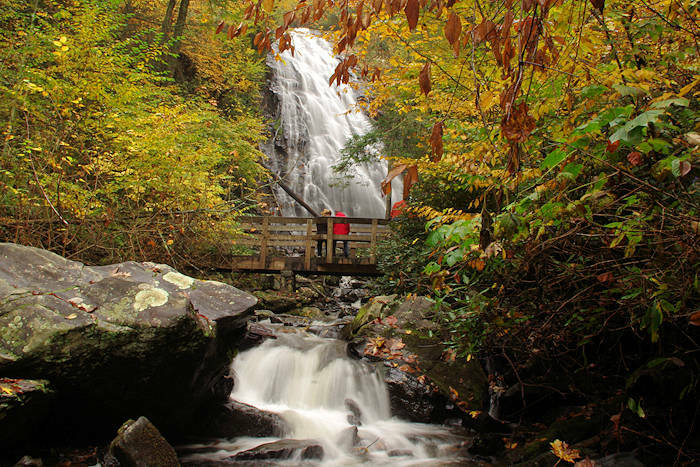 See our Blue Ridge Parkway Guide for more info. 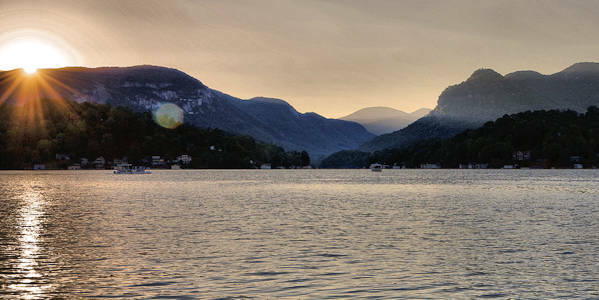 Lakes: What could be more romantic than watching the sun set behind the mountains surrounding a gorgeous lake? 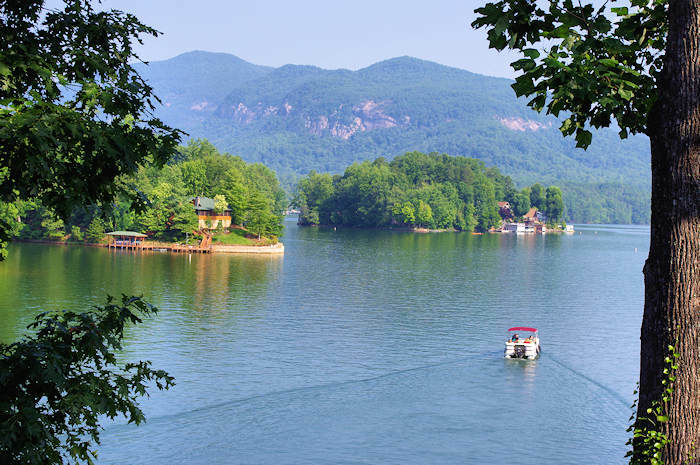 On Lake Lure (pic above), you can rent a pontoon at the marina or take a sunset cruise when you stay at Rumbling Bald Resort. At Lake Glenville, you can rent a pontoon from Signal Ridge Marina (read more). At Lake Junaluska, watch from your car, Inspiration Point or the lakefront trail. Mountaintop: Our favorite mountaintop hike near Asheville for either a sunrise or sunset is Craggy Pinnacle with 360-degree views above the Blue Ridge Parkway. It's a short hike, but bring a flashlight to help navigate the trail. With several observation areas, it's a great spot for a small picnic. Dress warmly, it can be 15-20 degrees cooler than the down in the city. While it varies according to the weather, it's usually accessible April through mid-November. Clingmans Dome: Arriving in the dark atop the highest peak in the Great Smoky Mountains and waiting for first light is a lot of fun if you don't mind getting up early. Be sure to allow time to hike the trail to the tower in the dark (bring a flashlight) and you'll need a jacket almost any time of the year. You can also watch the sunset, but the summit is more likely to be covered in clouds late on summer days. Open April-November. 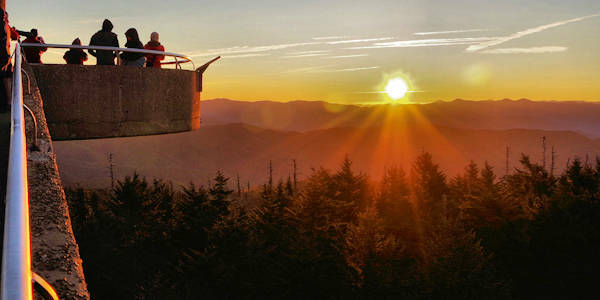 See our Clingmans Dome Guide. 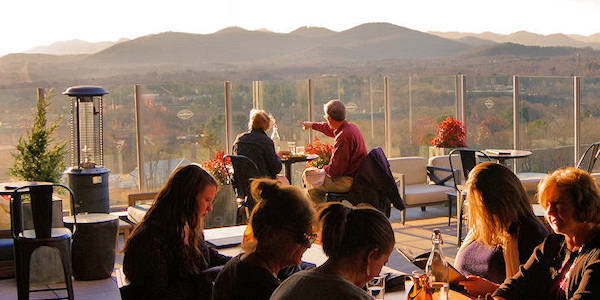 Downtown Asheville: Find several new rooftop venues in Asheville that provide westward views for the mountain sunset show with a cocktail or beer. See our Top Rooftop Bars.